Home » Uncategorized	» Southeast Examiner! 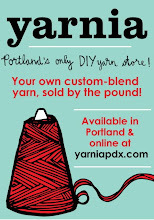 Those of you who live in the Southeast may have already spotted this, but Yarnia’s got a two-page writeup in this month’s Southeast Examiner! Be sure to grab yourself a copy, or click on the images below to enlarge and read it straight off the screen. Also, keep an eye out for a new section soon to be added to the online store — the bargain shelf! These one-of-a-kind blends are made from fibers that we’ve run out of and don’t restock regularly, so once they’re gone, they’re gone. And, by popular request, the online store will soon also be carrying blends made from more high-end fibers such as bamboo, alpaca, and silk blends. Stay tuned!